When Cold Climbs was published in 1983, the first two chapters on Beinn Bhan and the Fainnaichs were a revelation. 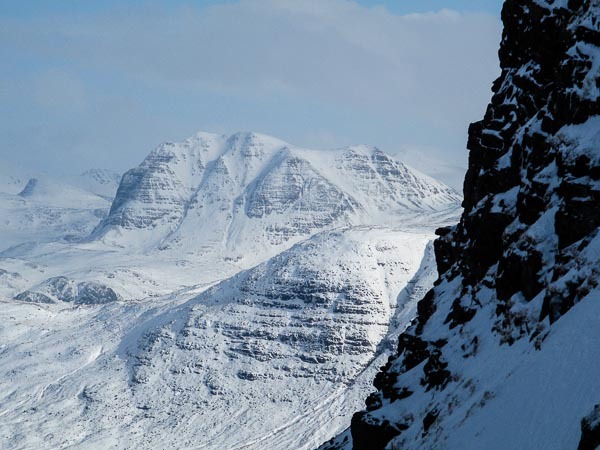 These areas were terra incognita for most Scottish climbers at the time, and they launched a multitude of dreams as keen winter climbers began to expand their horizons from Ben Nevis, Glen Coe and the Cairngorms. Thirty years on and the publication of The Great Mountain Crags of Scotland is having a similar effect. Roger Webb’s inspiring chapter on Slioch’s Atlantic Wall has intrigued many, and it was clearly not going to be long before the cliff saw some attention this winter. Before this season, Skyline Highway was the only winter route on the wall to have seen a repeat. On Saturday January 17, Erick Baillot and Rob Bryniarski repeated The Sea, The Sea (VII,7) the plum line up the centre of the face. This Roger Webb-Neil Wilson creation stems back to March 1996. I think Erick and Rob’s ascent was impressively quick. When I last climbed on Atlantic Wall Roger and I arrived back at the car after a 16-hour trip and Roger commented that this was the first time he’d ever climbed on Slioch and returned the same day he set off! This entry was posted in Repeats and tagged Erick Baillot, Rob Bryniarski, Slioch. Bookmark the permalink. A very notable ascent Erick……… considering this isn’t even supposed to be ‘your year’!! Impressive. Yep, Erick was still on a high from it when I saw him this afternoon. Also he must have been overtired as his timings were under but at least two hours. He said they left the road at about 5am and got back after 10pm making 17hrs. Erick is normally pretty reticent about his routes on a Monday. So I knew this was something special when he told me about this second ascent. He didn’t look too tired so I guess he had a good sleep on Sunday?? Lucky man. Yes I am ashamed to say that I cannot count properly. I’ll try to blame it on not being my native language but…we were 17 hours round. And I made a mistake in Rob’s surname! Bryniarsky with 2 ys. Oh dear. 17 hours is quick enough!